Touted as a better, less painful alternative to traditional bone grafting, the Infuse Bone Graft came under scrutiny in past years due to the product’s potentially serious complications. The device’s manufacturer – the world’s largest medical device company – was also accused of construing study findings in favor of its product and prompted investigations from the US Senate and other federal agencies. Infuse is the brand-name of genetically engineered bone tissue used in bone graft surgeries. A bone graft is a surgical procedure to replace bone that is missing due to disease or trauma. This is possible because bone tissue, unlike most other tissues in the body, is able to completely regenerate if given the space to do so. As the new bone grows, it usually replaces the graft material. Traditionally, bone was harvested from a patient’s own body, often from the hip, wrist, ribs or pelvis. Harvesting bone from a patient’s own body required two surgeries, one to harvest the bone and another to place it in the damaged area. Relatively recent advances in medical technology have eliminated the need to harvest bone from some patients because scientists can now grow synthetic bone tissue in the lab. The Infuse Bone Graft is an example of this technology. The Infuse Bone Graft is an alternative to harvesting bone from patients with certain bone or joint problems. It is made from a genetically engineered version of a protein the body makes naturally when bones are growing called recombinant human bone morphogenetic protein-2 (rhBMP-2). Proponents of the Infuse Bone Graft say the technology cuts down on the need for additional surgeries, which carry inherent complications, such as allergic reactions to anesthesia and infections, and can cause significant pain in the area where the bone was harvested. What is the Infuse Bone Graft used to treat? The Infuse Bone Graft is indicated to treat patients with degenerative disc disease undergoing spinal fusion surgery in the lower back. It was later approved for other uses, including in oral surgery and dental implant procedures. The Infuse Bone Graft has also been used “off-label” by many surgeons. Some off-label uses include during anterior and posterior cervical, thoracic and lumbar surgeries. The Infuse Bone Graft works by attracting the body’s own bone-building cells to the site where new bone growth is needed. The Infuse Bone Graft kit consists of genetically engineered rhBMP-2 proteins and a sponge made from bovine collagen that releases the proteins over time wherever it is placed. Eventually, the sponge is absorbed by the body and replaced by new bone. When did the FDA approve the Infuse Bone Graft? The FDA approved the Infuse Bone Graft in 2002. The Infuse Bone Graft was not the first synthetic bone graft to gain FDA approval. That medical and market first was captured by Wright Medical Technology Inc. in 1996, which introduced a synthetic ceramic bone graft. The Infuse Bone Graft was, however, the first pre-market approved rhBMP bone graft available to surgeons in the US. Who makes the Infuse Bone Graft? 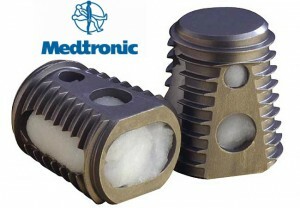 The Infuse Bone Graft is manufactured by Medtronic Inc., the world’s largest medical technology company. Medtronic is based in Minneapolis, Minn. but employs more than 85,000 employees in over 155 countries worldwide. In 2015, Medtronic brought in over $17 billion in net sales. The company’s Infuse Bone Graft certainly contributed to that number, considering the cost of the bone graft can be as high as $6,000 for hospitals. The price of the bone graft usually isn’t covered by insurance companies when used for off-label uses either. Medtronic has hundreds of products in addition to Infuse, including a newer version of the bone graft called Magnifuse, approved by the FDA in 2013. What are the possible complications of the Infuse Bone Graft? The Infuse Bone Graft was generally viewed as a safe substitute to traditional bone grafts, but the discovery of unreported adverse events from patients and doctors put the product into question. Now, the product is being linked to serious injuries, including nerve damage and a possible increased risk in developing cancer. Does the Infuse Bone Graft cause cancer? A peer-reviewed study published in 2013 showed patients using Infuse Bone Grafts were at a two-fold increased risk of developing cancer compared to patients using traditional bone grafts. The researchers concluded that at 24 months, Infuse increased fusion rates and reduced pain by a clinically insignificant amount compared to traditional bone grafting. This means surgical outcomes were essentially the same for patients using Infuse and patients using bone grafted from their own bodies in terms of pain and fusion rates. Researches did note that patients complained of more pain immediately following surgery when using Infuse compared to traditional bone grafting. Researchers also found evidence of an increased incidence of cancer when using Infuse compared to traditional bone grafts. The Yale study results showed patients’ risk of developing cancer nearly doubled when using Infuse, but because the sample size was small, researches said the results were inconclusive. Did Medtronic hide evidence of potential Infuse complications from the public? Medtronic came under scrutiny recently after reports the company failed to submit adverse events to the FDA surfaced, prompting investigations by federal agencies. The Minneapolis-based newspaper Star Tribune reported in April 2016 that Medtronic had discovered roughly 1,000 adverse events from patients who had been injured – and in some cases died – after having Infuse inserted during surgery. The article also touched on earlier accusations against Medtronic that allege the company had construed study findings in favor of its Infuse product. In 2012, the Senate Finance Committee conducted an inquiry into Infuse and found Medtronic had been heavily involved in shaping, editing and writing the research of company-paid physicians. A year earlier, an article published in the North American Spine Society’s Spine Journal in June 2011 indicated the adverse events from Infuse could be 10 to 50 times higher than original estimates. Merely days after the Star Tribune article was published in April, U.S. Senator Al Franken of Minnesota asked Medtronic to provide more details about its handling of adverse events. The Democratic senator said Medtronic’s handling of the Infuse study may have “potentially skewed the risk profile” for the thousands of patients who have been implanted with the product, the Star Tribune reported. Has the FDA reprimanded Medtronic for failing to report adverse events? The FDA issued two separate warning letters to Medtronic in 2007 and 2009 for failing to report adverse events, but the agency allowed the company to submit merely a summary of events — instead of individual narratives — when the company finally started reporting them in 2013. Has the Infuse Bone Graft been recalled? The Infuse Bone Graft has never been recalled due to potential safety issues with the product. Are there lawsuits against the makers of the Infuse Bone Graft? Medtronic has faced several major lawsuits in recent years regarding its Infuse Bone Graft, and patients harmed by the product continue to add to the company’s mounting litigation. Medtronic paid out about $85 million in a 2012 settlement agreement with shareholders who claimed the company made misleading statements about Infuse that hurt stock prices. The company is currently fighting a lawsuit filed by insurance company Humana, who alleges Medtronic marketed Infuse for uses that weren’t approved and tricked the insurance company into paying for them. A number of patients who say they were harmed by the Infuse product have also filed lawsuits against Medtronic. These cases have not been consolidated into multidistrict litigation (MDL), nor have they been filed as a class action lawsuit. Currently, lawsuits against Medtronic regarding its Infuse product are being filed individually, mostly in state courts. It is unclear at this early stage whether these cases will settle before reaching trial or how much the settlement amount would be if one is reached. I had a bone graft using Infuse and suffered serious side effects. Can I file a lawsuit? If you or a loved one were injured after being implanted with Medtronic’s Infuse Bone Graft, you may have legal options. Call National Injury Help today to speak with a member of our legal team. We can answer your questions and help determine if you have a case. If your case qualifies, our experienced Medtronic Bone Graft lawyers and attorneys will help you seek the justice you deserve. Call 1-800-214-1010 for a free case evaluation today, or fill out the form on the right-hand side of your screen.